Every Person in the Fleet, who through Cowardice, Negligence, or Disaffection, shall in Time of Action withdraw or keep, or not come into the Fight or Engagement, or shall not to do his utmost to take or destroy every Ship which it shall be his Duty to engage, and to assist and relieve all and every of his Majesty’s Ships, or those of his Allies, which it shall be his Duty to assist and relieve, every such Person so offending, and being convicted thereof the Sentence of a Court-martial, shall suffer Death. 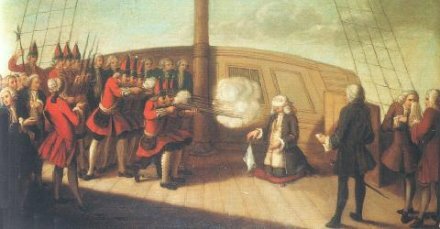 On this date in 1757, English Admiral John Byng was shot to death by musketry on the quarterdeck of the HMS Monarque for failing to “do his utmost” to defend Minorca against the French. The first and last man of that rank executed by the Royal Navy, Byng was one of 15 (!) children of an ennobled admiral. He’d been 40 years at sea himself, a competent, forgettable senior officer unburdened by genius. The 1750s found him in service of a listless British Empire sliding towards war with France. London had her eye mostly on the North American conflict already underway … but that conflagration was about to jump the pond. In 1756, the Brits belatedly realized the French were about to grab the Mediterranean island/naval base of Minorca (Menorca) from them, and dispatched a too-little, too-late expedition under Admiral Byng. By the time he got there, the French already had Minorca in hand, save the last, besieged garrison. Byng attempted to land reinforcements for the garrison — without enthusiasm, since he perceived the inadequacy of his force — and was repelled in an inconclusive naval engagement. The loss of Minorca raised the curtain on the Seven Years War: the first “world war,” in Winston Churchill’s reckoning, in which European alliances would duke it out for continent and colonies. But it dropped the curtain on the ill-starred Admiral Byng. Popular outrage at the military setback had the Duke of Newcastle‘s government scrambling to find a scapegoat, and the commander on the scene fit the bill exactly. A gloating French account of the engagement — “the English had the advantage of the wind, but still seemed unwilling to fight” — reached Albion’s shores ahead of the admiral’s dispatch; when the latter arrived, it was publicly leaked in unflatteringly redacted form that generally made Byng look like a big fraidy-cat. 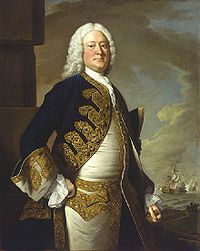 Having been thus attainted in the court of public opinion, the admiral was hailed before a court martial and convicted of not doing enough to relieve the English garrison and generally not fighting a very good fight. Only one penalty was prescribed for this offense: death. But Hanoverian George II had no upside in getting involved. He faced complaints enough wringing the revenue out of Englanders to defend a hereditary German electorate of no consequence to British security; what sense could there be in antagonizing the irritated masses by going to bat for the official fall guy in the realm’s scandalous military reversal? On the day fixed for his execution [relates the Newgate Calendar] the boats belonging to the squadron at Spithead being manned and armed, containing their captains and officers, with a detachment of marines, attended this solemnity in the harbour, which was also crowded with an infinite number of other boats and vessels filled with spectators. About noon, the Admiral having taken leave of a clergyman, and two friends who accompanied him, walked out of the great cabin to the quarter-deck, where two files of marines were ready to execute the sentence. He advanced with a firm deliberate step, a composed and resolute countenance, and resolved to suffer with his face uncovered, until his friends, representing that his looks would possibly intimidate the soldiers, and prevent their taking aim properly, he submitted to their request, threw his hat on the deck, kneeled on a cushion, tied one white handkerchief over his eyes, and dropped the other as a signal for his executioners, who fired a volley so decisive, that five balls passed through his body, and he dropped down dead in an instant. The time in which this tragedy was acted, from his walking out of the cabin to his being deposited in the coffin, did not exceed three minutes. The execution of John Byng, from the British National Maritime Museum. Thus fell, to the astonishment of all Europe, Admiral John Byng; who, whatever his errors and indiscretions might have been, was at least rashly condemned, meanly given up, and cruelly sacrificed to vile political intrigues. Whatever the morale effects, the British soon rallied from their early setbacks in the Seven Years’ War and emerged from the conflict undisputed masters of North America and India. And they even got Minorca back, too. Gotta go with Voltaire on this one.